The recent debate over coalition strategy against ISIL has reawakened a related question: whether to support rebel groups in Syria in their fight against ISIL and Bashar al-Assad, and if so how? Even former US Defense Secretary Leon Panetta is now expressing regret  at not having armed certain Syrian rebel groups earlier. It seems the US will train and arm some rebels but not send Special Forces to embed with and advise them. Two important concepts appear to be absent from the strategic culture of the US and most Western countries: unconventional warfare and strategic optionality. Unconventional warfare (UW) is often confused with asymmetric warfare or hybrid warfare. But UW has a specific definition . It refers to ‘activities conducted to enable a resistance movement or insurgency to coerce, disrupt, or overthrow an occupying power or government by operating through or with an underground, auxiliary, and guerrilla force in a denied area’. UW is what the US engaged in at various times throughout the Cold War when it deliberately supported insurgent groups in Tibet, Angola, Nicaragua, Indonesia, and Afghanistan, for example. It’s also what the US did so effectively in the opening stages of Operation Enduring Freedom. UW is frustrating for the strategist for at least two reasons: the complexity of groups and allegiances, and the principal–agent problem. The first reason is self-explanatory to anyone who’s tried to keep track of the factions involved in the ongoing civil war in Syria. The principal–agent problem, explained by political scientist Idean Salehyan , says proxy forces don’t always act the way you want them to—they have their own interests. That’s what economists and political scientists call agency slack. If there’s too much slack the group may not be a reliable partner . Reducing agency slack requires leverage through economic, physical, and emotional incentives. To influence your insurgent proxy you need to be there on the ground with them, earn their respect, support them, and demonstrate your ability to improve their chances of success. You can’t just drop some bombs on their enemy or offer to train them. They’d be pleased if you did, but would owe you nothing. Those two challenges help explain why UW campaigns aren’t central to US and Western strategic culture. UW is rarely the main effort of a US military campaign. Usually, proxy forces play a supporting role intended to increase the relative friction faced by an adversary while a larger conventional campaign defeats the enemy force. The OSS support to the French resistance in World War II is an example. For UW to play a more decisive role there must be a more fulsome embrace of the strategy. While embedding advisers helps address the principal–agent problem, optionality helps address the problem of groups and allegiances. Strategic optionality is best described as the deliberate employment of multiple, parallel efforts to shape the environment and the behaviour of actors within it. Additionally, it comes with the intent of selectively switching support as a campaign unfolds: abandoning ineffective or counterproductive efforts in order to increase support for effective ones. It’s a fancy way of saying ‘create options, seize opportunities, and cut losses’. Strategic optionality means sometimes you have to invest effort and resources at one level in order to ensure that you have options later to influence outcomes at another. Two recent historical UW campaigns help illustrate why strategic optionality is important if proxy forces are to be central to victory. Consider the first phase of Operation Enduring Freedom (OEF) and compare it to the recent NATO Campaign in Libya. After 9/11 the US military adopted a strategy based upon UW and strategic optionality. By inserting numerous CIA and Special Forces teams to work with the many factions of the Northern Alliance, the US committed blood and treasure to an uncertain strategy. In return, strategic leaders gained a better understanding of the proxy forces that would determine the future of the country. And because the US had embedded people, training, money, weapons and combat power, it could influence its proxies and shape outcomes. It did so through personal relationships which enabled it to strengthen Hamid Karzai as a viable national leader and use its influence to ensure that the rest of the Northern Alliance didn’t fracture and fight each other. 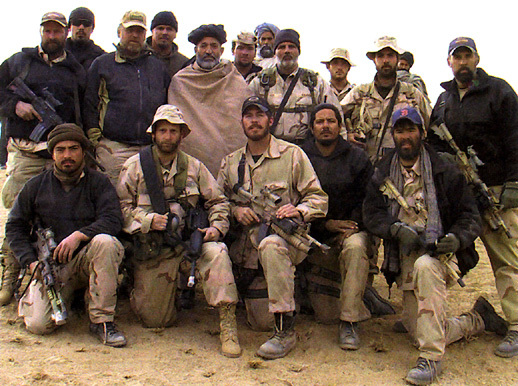 The US even had to pull out some special forces teams early in OEF  because their proxy militia proved an unreliable and counterproductive partner. The extraction of those teams was not a failure or a bad investment, it was part of the strategic optionality necessary in a UW campaign. In Libya, NATO conducted UW on the cheap through the application of combat power in the form of air strikes, but refused to embed Special Forces, thereby limiting the conduct of UW. It had no relationships and no leverage over its proxies. Much like the current Syria strategy, NATO leaders in charge of the Libya campaign used UW without optionality and hoped that the disparate groups would somehow come together on their own; the result was a failed state and a terrorist safe haven. What outcome is the coalition seeking in Syria and Iraq? If it intends to conduct a UW campaign and rely on proxies to defeat ISIS and Assad then it should embed Special Forces and exercise some strategic optionality. Lieutenant Colonel Jan K. Gleiman is an active duty US Army officer and a visiting fellow at ASPI from United States Pacific Command. The views expressed in this post are his own. Image courtesy of Wikipedia .